SkyRise® ombines with other Skyline structural systems to create a complete solution and customized environments of any size. 3” thick aluminum frame with welded corners provide a rigid panel construction. Plus, panels connect quickly and easily with tool-less installation. One exhibit gives you many looks to meet your changing needs. Save money by reconfiguring the exhibit using the same panels for a different structure. Combine with other Skyline structural systems and accessories to give you the functionality you need. 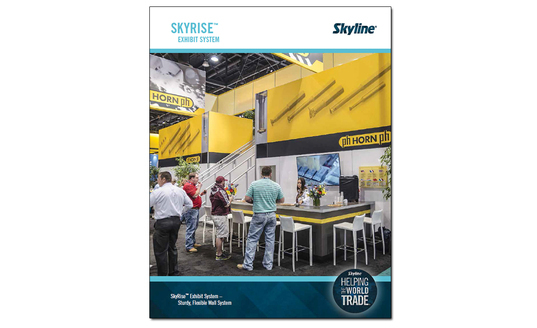 Request a FREE copy of the SkyRise® Wall System brochure! Complete the form and we'll send you one as soon as possible!